THE "TV CHOPPER" SHOTS SYNTHETIC CROWDS ASSEMBLY LINE IMAGERY THE WASHED OUT FRAMES THE "MIRACLE ZOOMS" THE "JUMPERS"
Yes - ALL the existing 9/11 imagery depicting "people jumping to their death" has been methodically dissected on Cluesforum.info. ALL have been proven fake - beyond reasonable doubt - through multiple methods of analysis and logical observation. Before we have a look at a few "9/11 jumpers", here is an animated gif extracted from the movie "SKYSCRAPER" (1996). To be sure, it is totally beyond debate that the technology to manufacture such (fairly) realistic-looking imagery existed long before 2001. Now, unarguably, the most 'powerful' 9/11 images imprinted in the TV-audience's psyche were the people seen jumping out the WTC windows - on TV (although NO jumpers were seen in the LIVE 9/11 broadcasts). 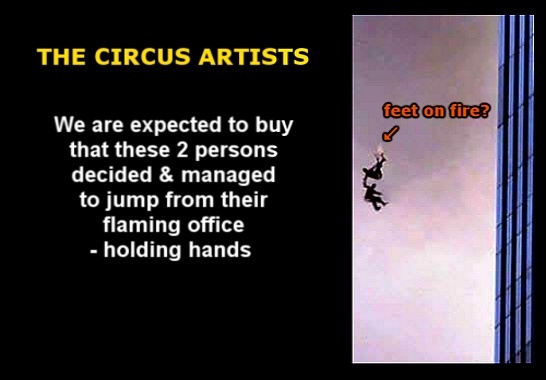 ALL the "jumper imagery" seen on TV was released only later on. The 3 first clips we are going to analyze here are (meant to be) by the same amateur cameraman; I am going to call him "Joe Wonder" for the purpose of this study. This is from an almost 13min-long video which our Joe allegedly shot in the streets of Manhattan. The History Channel has featured some clips of this alleged 9/11 amateur video - so it has indeed been aired on television. In the video, Joe is walking around the streets with his hand-held camera, as jerky as one would expect. As Joe approaches WTC1, he tilts the camera upwards and catches a couple of people falling down its side. He then gets shoved away by police - but somehow manages to hang around, filming the towers. A while later (amidst much hustling and commotion), he manages to point his lens at 3 separate "jumpers" and, with a wondrously steady hand, follows all three from top to bottom. At close inspection, the 3 shots are nothing short of superhuman: They are all preceded by a sudden ZOOM IN, something that is known to multiply the unsteadiness of a hand-held camera. Nonetheless, the 3 jumpers appear to be 'glued' to the center of Joe's lens. The chances of anyone achieving not one, but three 'perfect' pan-shots in such difficult conditions are, to put it mildly, ludicrously remote. Thus, once again, it is infinitely more likely that what we are looking at is computer-animated imagery. To be fair, Joe Wonder's full video is a pretty deceptive entry to the 9/11 'virtual reality' footage. It can seem realistic at a first viewing - yet it doesn't hold up to close scrutiny, mostly due to flawed renderings, dodgy building perspectives - and an awfully corny, contrived soundtrack. Ultimately, it squarely fails at what it was meant to simulate: "A legitimate amateur video shot by a real eyewitness in close proximity of the World Trade Center". "Joe Wonder's" video was most likely created for this specific purpose: to convey the idea that the WTC complex was still bustling with bystanders staring at the towers at close range. In reality the area was, at the time, mostly evacuated and sealed off. 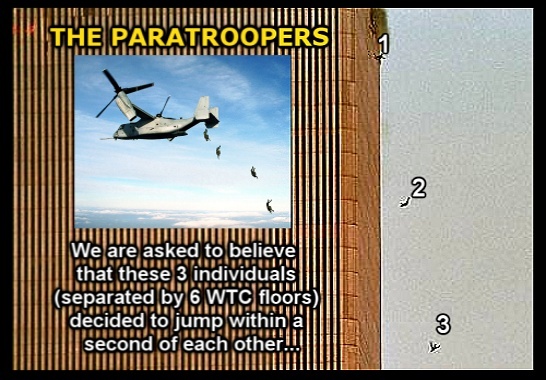 "THE JUMPERS" were all photoshopped - or animated, just like most of the 9/11 imagery offered to the public.